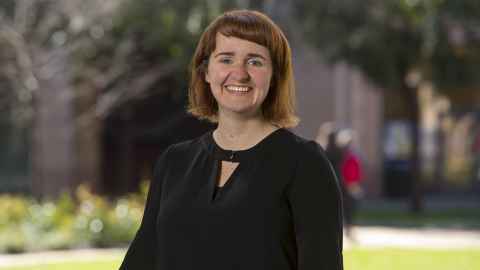 Sinead Brennan-McMahon has won a prestigious scholarship to Stanford in the US. The scholarship is named for its two biggest benefactors — Stanford alumnus Phil Knight, co-founder of Nike Inc; and John Hennessy, chairman of Google's parent company Alphabet Inc. The scholars receive full funding to pursue any graduate degree at Stanford. The Knight-Hennessy Scholars programme is the world's largest graduate fellowship scheme with an endowment of $750 million. Recently established, the inaugural scholars were announced last year and of the 2019 scholars, 30 percent are from outside of the United States. The programme aims to develop an interdisciplinary community of future global leaders to address the world's most complex challenges through collaboration and innovation. Sinead will pursue a PhD in Classics (Language and Literature) at Stanford School of Humanities and Sciences. She holds a Bachelor of Arts and a Master of Arts degree, both with first class honours, in Latin, and a Diploma in Languages in Ancient Greek, from the University of Auckland. Stanford is uniquely equipped to support my research interests because it has a long history of interdisciplinary collaboration between the Arts and Sciences. "I am just thrilled to take up the place at Stanford and in the Knight-Hennessy Scholars Program. In particular I want to work on a software program that can take the manual work out of comparing different manuscripts of the same Latin text," she says. "Stanford is uniquely equipped to support my research interests because it has a long history of interdisciplinary collaboration between the Arts and Sciences. The Classics department works very closely with the Computer Science department and has the support of initiatives like the Centre for Spatial and Textual Analysis (CESTA) so it is a perfect match for my research interests." Previously Sinead was a web developer at McMahon Butterworth Thompson Lawyers, on the editorial board of the Amphora Issue journal, and selected to tutor and lecture in Latin and Classical Studies at the University of Auckland. "I'm so grateful to my supervisor Dr Maxine Lewis for her encouragement and guidance, and to the outstanding Classics and Ancient History department at the University of Auckland." She begins her studies in California in September this year.